The veterinary software is a practice management software and veterinary imaging software which helps veterinarians in appointment management, billing and invoicing, boarding management, patient records, prescription labeling, reminders and treatment management. Globally increasing pet owners and veterinary practitioners is expected to remain key growth drivers for veterinary software during the period of study. This report identifies the Veterinary Software market size in for the year 2015-2017, and forecast of the same for year 2022. 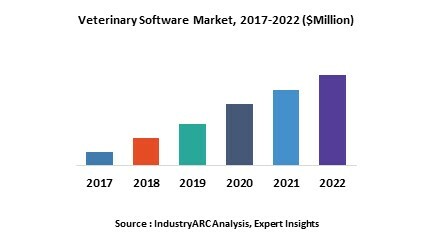 It also highlights the potential growth opportunities in the coming years, while also reviewing the market drivers, restraints, growth indicators, challenges, market dynamics, competitive landscape and other key aspects with respect to Veterinary Software market. Geographically North America dominated the Veterinary Software market owing to awareness amongst the people about veterinary healthcare, large number of pet number and government initiatives for animal healthcare. North America was followed by Europe and Asia-Pacific as the second and third largest markets for veterinary software. However Europe is likely to be enhanced due to rising awareness about veterinary software and relaxed taxations for the better adoption of veterinary computer equipment and software. 16.5. Britton's Wise Computer, Inc.